From Al Fahim’s flowing fabrics to Hobeika’s lace and floral prints, the return of embroidery has been a welcome sight this season. Major designers and high-street retailers have been releasing collections evoking embroidered style with chic bohemian results, and we’ve fallen head over heels for it. It is exquisite detailing like this that elevates a dress from beautiful to amazing, mesmerising those in close proximity with texture, character, and intriguing story. Be inspired by these latest designs we haven’t been able to take our eyes off. 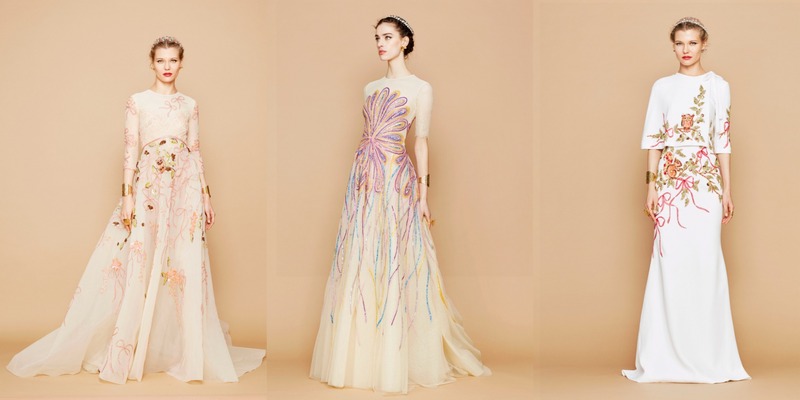 Embroidery is a beautiful skill; the top couture collections by Hobeika and Al Fahim has encouraged this ancient trend to a more aesthetic and appreciating level. Whether it’s a single flower design or a natural pattern over the shoulder, the detail resembles a Scandinavian, Indian feel. Hobeika’s playful tree branch embroidery is easily defined as luxury-on-fabric. Crisp, white feathered gowns contain a sort of power that is pleasing, yet enduring. When it comes to Al Fahim, full-length ballerina and tulle embroidered dresses are still in fashion. Birds of a feather, we stick together, right? There’s a lot of playful contrast found in Al Fahim’s newest collection. Its texture is detailed with animalistic embroidery and beading placed on the gown’s torso, and let’s not forget the accentuating ruffles and intricate cuts. Hobeika’s elegant designs have whimsy effect, with the equal amount of edge and class. The sheer black with an addition of golds and pink’s offer another point for the eye to be drawn to, adding a chic element without diminishing the level of sophistication. The overall feathered feel has brought the world lusting over and over again. The transition between colour schemes – white and black – to the neutral aspect is intriguing. Georges Hobeika lacks no colour with green and grey embroidered gowns that create an impressive autumn collection built on textures and shapes. The expansion of detailed vines is beautifully placed with a strong pattern style that is also nature-friendly.